Not to be confused with Barium sulfate. Barium sulfide is the inorganic compound with the formula BaS. BaS is an important precursor to other barium compounds including BaCO3 and the pigment lithopone, ZnS/BaSO4. Like other chalcogenides of the alkaline earth metals, BaS is a short wavelength emitters for electronic displays. It is colorless, although like many sulfides, it is commonly obtained in impure colored forms. The phosphorescence of the material made by Casciarolus made it a curiosity and various alchemists and chemists made experiments with the material which was known as Lapis Boloniensis, Chrysolapis or bologna stone. Andreas Sigismund Marggraf showed that calcite and gypsum were not very suitable for the production of the bologna stone, but a special heavy fluorspar, in the end he concluded that calcium sulfate is the material from which the bologna stone is made. Recent investigations have shown that naturally occurring impurities of copper in the barium sulfide produced from barium sulfate deposits near Bologna are the likely cause of the phosphorescence. 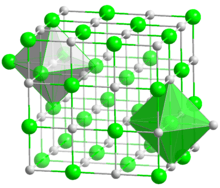 BaS crystallizes with the NaCl structure, featuring octahedral Ba2+ and S2− centres. BaS is quite poisonous, as are related sulfides, such as CaS, which evolve toxic hydrogen sulfide upon contact with water. ↑ Vij, D. R.; Singh, N. "Optical and electrical properties of II-VI wide gap semiconducting barium sulfide" Proceedings of SPIE (1992), 1523 (Conf. Phys. Technol. Semicond. Devices Integr. Circuits, 1992), 608-12. ↑ Lemery, Nicolas (1714). Trait℗e universel des drogues simples. ↑ Ozanam, Jacques; Montucla, Jean Etienne; Hutton, Charles (1814). Recreations in mathematics and natural philosophy ..
↑ Marggraf, Andreas Sigismund (1767). Chymische Schriften. ↑ Lastusaari, Mika; Laamanen, Taneli; Malkamäki, Marja; Eskola, Kari O.; Kotlov, Aleksei; Carlson, Stefan; Welter, Edmund; Brito, Hermi F.; Bettinelli, Marco; Jungner, Högne; Hölsä, Jorma (2012). "The Bologna Stone: history's first persistent luminescent material". European Journal of Mineralogy. 24 (5): 885–890. doi:10.1127/0935-1221/2012/0024-2224. ISSN 0935-1221.